This little raised cross. Torn marks cut deep all around leaving scars like I’ve felt in life. But it doesn’t define me. The cross within me remains the stronger beat. I’ve learned that keeping a positive outlook in life can set your direction. My dad helped form this perspective early on in me with his ongoing upbeat nature. It was my “pre-faith” faith. The first struggles I really had in life were health-related, being diagnosed with ulcerative colitis at age 18, an auto-immune disease, with no cure or known cause. It was embarrassing and painful many times. I was hospitalized the month before I started college for a rare reaction to a medication. Then 2 years later I had to drop out of a college semester due to a bad flare-up. I guess these health struggles, and forced recovery times, when all you could do was lie in bed, helped form my determination. You just keep going. Sometimes the marks life leave are visible too long, a reminder of the pain. Failed relationships, false securities in economics, loss of those we love, and other things life throws us. But I won’t stay there. It would have been easy to give up, but YOU can’t. There is always more. More for us, more to give and more to learn. Rev. Adam Hamilton often says, “Because the last thing, is not the worst thing.” The grace of the cross. I now see this positive mindset as a fundamental element of faith. Do good. Believe. Hope. Trust. It was part of my faith foundation before I even knew to discover and form my own faith (not faith borrowed from your parents). Starting small with the size of a mustard seed, faith grows. The little things in life are big. That is how good the Cross is. 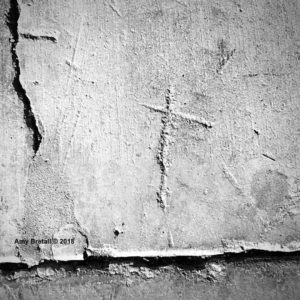 This concrete cross image is one of my favorites – tossed aside concrete in the making of something else. A leftover not even removed from the focus of the project. The outcome is the formed in the unformed. It is a powerful reminder for what the scraps and unintended marks can make — we are an art form in the making. Raised up, reclaimed, repurposed, redefined, rejuvenated…stronger for the marks! Redeemed. LIVE your inspiration. BREATHE in Faith. Let us be ALIVE in Faith! LiveBreatheAlive.com. The Everyday Cross Series, formed in the unformed: Designed to encourage others to seek and see the cross in everyday life. Thank you Carla for your thoughts! I agree on the cross being a mark of hope and to keep pressing on. Appreciate your comment and reading. I love the idea of the cross raised up against the field of the ordinary. The stark irregular frame of the picture reminds me of how life is framed from time to time. Without the cross we would face a stark and lonely existence. Thank you Ann for reading and taking time to comment! Your interpretation and viewpoint of the image and cross is appreciated.